On the books of Celtic when he was younger, Tony Moy was arguably the best goalscorer Clydebank have ever had. Fifty years after he last played for the Bankies only six players have scored more goals than Tony and none of them come even close to his goals to games ratio. He scored a total of fifty five (55) goals in just eighty appearances. 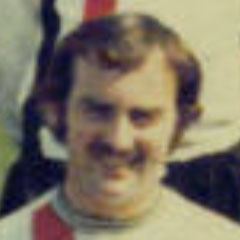 Tony Moy was one of the players who turned out for Clydebank in the Scottish Combined Reserve League in season 1965/66, after Clydebank had seen their application to join the Scottish League turned down, although nineteen clubs approved the Clydebank application eighteen voted against. A two thirds majority was required so Clydebank lost out. Tony Moy endeared himself to the Clydebank fans as he had a handy knack of scoring against our good neighbours Dumbarton. This included a New Year's Day game on 1 January 1968 on a light snow covered Kilbowie Park, when he hit, or more accurately mishit a shot from outside the box that had barely the strength to reach the Dumbarton goal, amazingly the ball squirmed under the Dumbarton keeper and just managed to cross the line for what proved the winning goal in a 2-1 home victory. It should also be remembered that Moy scored these goals in a Clydebank team that struggled to find their feet in their first season in the league, finishing just one point off the bottom spot with just eight wins in thirty eight games. He was good in the air, quickly brought the ball under control and deadly in the box. He decided to leave the Scottish League Division Two and ply his trade in the Southern League Premier Division, and signed for Chelmsford City for a transfer fee of £3,200. He scored a hat-trick on his debut for City against Burton, and the following season he joined their local rivals Brentwood, and scored twice on his debut v. Hereford. When the two clubs amalgamated, he found himself back at Chelmsford, but with limited appearances he joined Dover, with a fee of £600 thought to have been involved. Dover manager Terry Adlington had been impressed with him when he scored three against Brentwood. Tony made his Dover debut on the 9th January 1971, and scored once in a 3-0 win against King’s Lynn, keeping up his record of scoring on his debuts. He immediately impressed with his skill and goalscoring ability, and he soon became a favourite at Crabble. He was top scorer three seasons in a row, with 26 goals in 1971-72, 19 in 1972-73 and 18 in 1973-74. After scoring 77 goals in 177 starts for Dover, he joined Dartford soon after the start of the 1974-75 season, but didn’t stay there long before he moved to Maidstone. He then had a brief spell at Bexley United before retiring from football. Tony was born on this date in .